You've purchased your turkey and cooked it to perfection. Now, it's time to carve up the bird and serve it! To think, though, some people might go their entire lives and never get a chance to carve a turkey. The task may seem intimidating: if it's your first time, you don't want to make a mess of it. And if you've done it before, you really don't want to make a mess of it. But don't worry, we've created this quick tutorial on the easiest, most elegant way to carve a turkey. Resting a piece of meat means taking it out of the oven and letting it sit for a certain amount of time before slicing or carving it. In the case of a turkey, we recommend letting the turkey rest for at least 30 minutes. Resting your turkey does two important things: one, it gives the juices in the meat a chance to settle, so they don't go spilling across your cutting board when you start carving. (The more juices you lose, the drier your turkey will be). And two, it allows time for the bird to cool, so it's easier for you to work with. When it's time to carve the turkey, we don't recommend trying to do it at the table. The process involves a certain amount of grappling with the bird that is best confined to the kitchen. Besides, you don't need the added pressure of performing for an audience. We suggest using a carving board with a moat around the edge. If you rested the bird adequately, (i.e. for at least 30 minutes), you should not see an ocean of juices pouring forth. But it's still a good idea to have the ideal tool for the "just-in-case" situation. So, carve your turkey in the kitchen, platter it up and then bring it out to the table. It will still make a great statement! Some folks suggest using a carving knife, a boning knife, AND a chef's knife. Those specialty blades are thinner, longer, and more flexible. But if you've cooked your turkey properly, the joints are going to come apart pretty easily, so your chef's knife should be more than adequate to do the job. Do make sure, however, that whatever knife you use, it's sharp. (Of course, your knife should ALWAYS be sharp.) When carving a turkey, you want to be able to slice through the skin without shredding it. The goal is to ensure that each slice of meat has its own skin still on it. Grab your knife and pick a leg. Gently slice through the skin between the leg joint and the body, while simultaneously pulling the leg away from the carcass. As you pull, you'll see the natural seam between the leg and the body open up. That seam will guide your knife right around the thigh bone until it pops right out. Note that you're not cutting through the joint, you're just popping it out and using your knife to cut through the skin and connective tissue. Repeat with the other leg and set the legs aside for the time being. 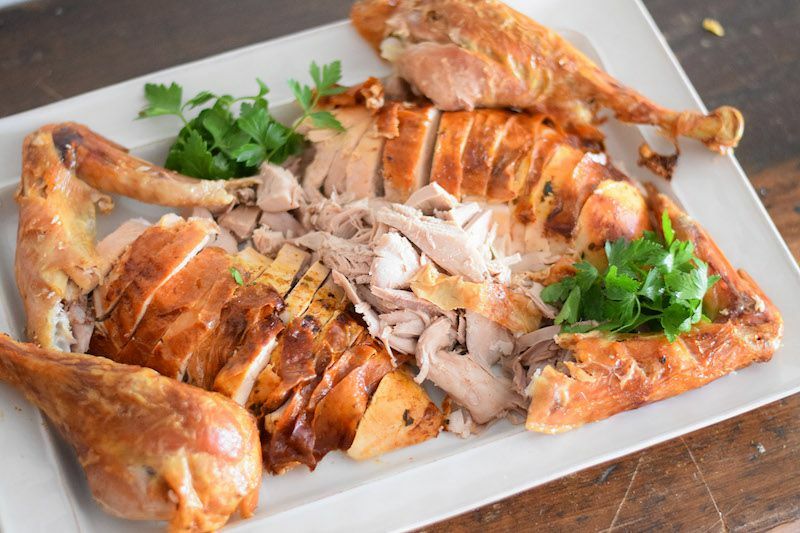 The breasts are going to take up a lot of space on your platter, so you'll want to platter them first and then arrange the drumsticks and dark meat around them. But before tackling the breasts, we're going to remove the wishbone. To be clear, you can definitely carve the breasts without removing the wishbone. But you can't make a wish without the wishbone, and it's easy enough to remove it, so you might as well. Some cooks like to remove it before cooking the bird, but for wish-making (as well as food safety) purposes, you want it to be cooked, not raw. Turn the bird so the neck is facing you. Cut an upside-down V in the flap of skin covering the neck cavity, then reach in with your fingers and pull out the wishbone. It'll be situated in just the same position as your upside-down V.
Locate the breastbone running down the middle of the carcass. It's also called a "keelbone" because it's shaped like the keel of a boat. Slice through the skin just to the side of the keelbone and continue slicing downward, hewing close to the breastbone while pulling the entire breast away with your other hand. The breast is a massive piece of meat, and it extends all the way down to the wing joint. Keep cutting and pulling away until you've removed the whole breast, with the skin still intact, in one piece. Now turn the breast skin-side up on your cutting board and slice it against the grain, on a bias, about half an inch thick. Shingle the slices on your cutting board in an appealing manner. Repeat with the other breast. Note: When we refer to the "grain" of a piece of meat or poultry, we're talking about the long strands of muscle fibers that run this way and that throughout the meat. Slicing against (or across) these strands shortens the muscle fibers, making them easier to chew (i.e. more tender). To separate the drumsticks from the thighs, turn the leg pieces over on your cutting board so that the skin side is down and you're looking directly at the meaty part of the joint. Now run your knife along the natural seam that separates the two joints, and they'll come right apart. Transfer the drumstick to your serving platter. Repeat with the other leg. Position the thigh skin-side down on the cutting board. Using the tip of your knife, cut away the meat along one side of the thigh bone, then roll the bone the other way and cut along the other side of it. You should now be able to remove the thigh bone (save for making stock) while leaving the thigh muscle intact and the skin still attached. Good job! Now slice the thigh meat, against the grain, on a bias, about half an inch thick, and arrange the slices on your platter. Repeat with the other thigh. We save the wings for last because up to now, they've been helping to stabilize the carcass on your cutting board. You can probably just pull them off, but use your knife to cut around any skin or meat. The wing consists of three sections: the pointy wing tip, the "flat" or "wingette," and the drumette, so called because it looks like a miniature drumstick. You can remove the wing tip (save it for making stock), then separate the drumette from the wing flat and arrange them on your platter. Repeat with the other wing. And that's it! On one platter, you have all your meat for serving, leaving you the carcass, two thigh bones, and two wing tips for making stock or soup. And last, but certainly not least, one wishbone, for granting wishes. Serve your freshly carved meet alongside cranberry sauce, creamy mashed potatoes, and savory stuffing for a traditional Thanksgiving meal. What Do You Do With the Oil From Your Turkey Fryer?